If you have visited Stade Vélodrome, why not submit your image of the view that you had. The Stade Vélodrome located in Marseille, France. It is home to the Olympique de Marseille football club of Ligue 1 since it opened in 1937 and it 2016 with host matches for the UEFA Euro Finals. The stadium has a capacity of over 67,000. he Stade Vélodrome is a state of the art facility, with an impressive seating layout. It was renovated in 1998. The stadium is located four kilometres away from the Old Port of Marseille. If coming from there, you can catch metro line 1 and change at station Castellane to line 2. 20,000 Seats in blocks A, B, C, D, E, F, G, H, I, J, K, L, M, R, S, T, U, V, W, X and Visitors area. 12,000 Seats in blocks A, B, C, D, E, F, G, H, I, J, K, L, M, N, O. 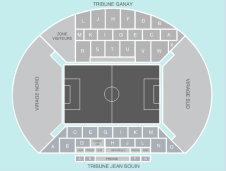 We currently do not have any events listed at Stade Vélodrome, please click on a seating plan for more information about seat locations at Stade Vélodrome.